Most people don’t have the IPv6 version of the Autodesk Network License Manager (NLM), because the IPv4 is installed by default. To check if you have the IPv6 version, start LMTOOLs and go to the System Settings tab. If you have the IPv6 version, you’ll see an IPv6 IP address like fe80::252d:8892:22e8:34d6. If you have the IPv4 NLM, you’ll see a regular IP address like 10.123.456.78. You can download the IPv6 NLM from autodesk.com/softimage-support. Sometimes running the IPv4 NLM in an IPv6 environment will work, sometimes it won’t. Other times, you may have intermittent problems. I don’t do so many licensing cases anymore, but checking IPv6 was always on my list of things to check. Just the other day, a customer reported that his render nodes could no longer get licenses. It turned out that after some recent updates, IPv6 was enabled and that was the cause of the problem. Installing the IPv6 NLM (or disabling IPv6) was the solution. You can use the Softimage Setup program to install the Autodesk Network License Manager (video). Just click Install Tools and Utilities. On my XP system, the value is saved under HKEY_LOCAL_MACHINE. 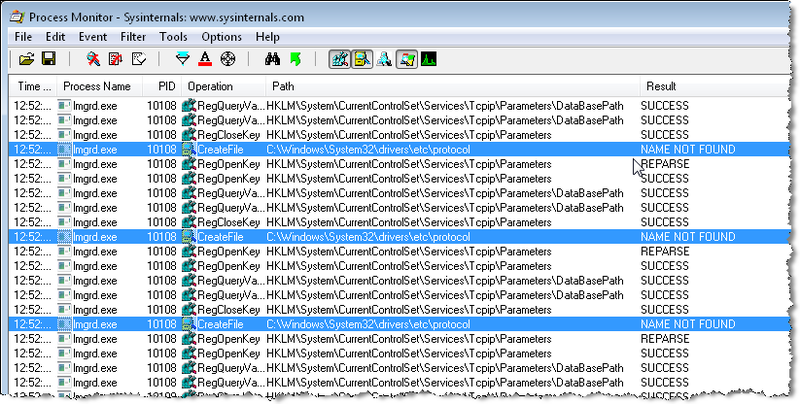 Over time, you may end up with some obsolete license server locations saved in the registry. 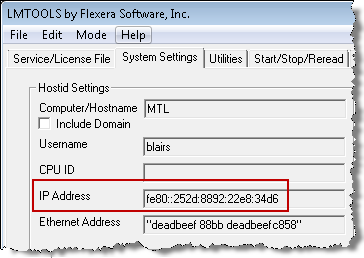 For example, if you replace your license server, the location of the old server is still in the registry. So whenever you cannot get a license, and everything else seems to check out ok, open up regedit and clear the ADSKFLEX_LICENSE_FILE value, to make sure Softimage is connecting to the right license server. xsibatch cannot get a license, even though setenv.bat an exact copy of the setenv.bat from a machine where xsibatch can get a license. It turned out the problem was because of ADSKFLEX_LICENSE_FILE. After he deleted that value, xsibatch connected to the license server specified by setenv.bat and got a license. 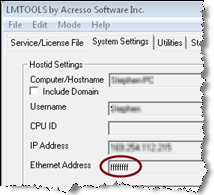 Just before the Christmas break, I had a case where LMTOOLS reported FFFFFFFF as the Ethernet address, even though ipconfig /all showed a valid Physical address for the network adapater. Because of this, the license server wouldn’t start. FFFFFFFF (eight F’s) is the broadcast address. I tried a number of things, like resetting the TCP/IP stack with netsh with no success. I spent quite a bit of time on google, but most of the information was old and no longer applicable. Eventually I figured out the problem, and was able to reproduce on my machine at home. It was the MAC Bridge Miniport: when I bridged my two network connections, then LMTOOLS thought the MAC address was FFFFFFFF. Right-click your local area connection and click Remove from Bridge. Right-click the Network Bridge and click Disable.